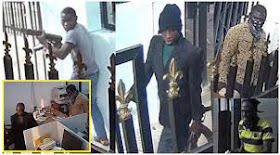 The Police have declared four gang leaders and principal suspects allegedly responsible for the bank robbery in Offa, Kwara State wanted. No fewer than 17 people including policemen were killed in the bloody attack on five banks on April 5. Though the names of the suspects are unknown for now, the police also released the CCTV photographs of the suspects to enable the public assist in identifying them and reporting the suspects’ whereabouts for arrest. The police have also promised to reward anyone with useful information, in addition to the N5million bounty promised by the Kwara State government. Giving update of investigation conducted so far, the Force Spokesman, Mr Jimoh Moshood in a statement, said: “The Nigeria Police Force is making significant progress in the investigation into the Offa Banks robbery in Kwara state that occurred on 5th April, 2018. On the outcome of the recent investigation, Moshood said: “Currently, some of the other gang leaders and principal suspects at large are being identified and their pictures obtained for further investigation. “To this end, the photographs of these wanted suspects are now being released to the public for assistance from public spirited individuals and general public for information to arrest them. The police urged members of the public with useful information on the suspects to call the following Phone numbers; 08062080913, 08126285268, 08032365122, 07056792065, and 08088450152. The police also promised to protect would be informants.